High Drug Prices: Who is Responsible? With prescription drug prices very much in the news, the question often asked is: Who is responsible for high drug prices? Pharmaceutical manufacturers — and no one else — set drug prices. In recent years, this has led to ever-increasing launch prices, and double-digit price increases from one year to the next. In most cases, the increases are unrelated to product changes or improvements. These trends are a big reason for the emergence and growing popularity of value-based management approaches that tie reimbursement for a drug to the outcomes it delivers. One particular concern over drug pricing is the abuse of the 1983 Orphan Drug Act. This important program was established to incentivize drug manufacturers to develop products to treat rare diseases that affect fewer than 200,000 people. However, some manufacturers have been manipulating certain provisions of the act to boost their profits and raise prices on existing drugs. In several cases, manufacturers have sought — and received — orphan drug status for drugs that have already been approved for a different disease or indication and are widely available. Achieving orphan drug status offers manufacturers benefits including expedited review by the U.S. Food and Drug Administration (FDA). Once a drug has been designated as an orphan drug, some manufacturers raise the price significantly – sometimes by more than a thousand-fold. This enables them to benefit from a high price newly set for a drug that has been available for a long time, and in many cases wasn’t even developed by the manufacturer. We do not believe that orphan drug status, and all of the financial benefits it brings, should be awarded for drugs that will treat millions of people or in cases where the company hasn’t actually developed a new treatment. CVS Health strongly encourages the FDA to review its orphan drug approval criteria to ensure that drugs that receive this designation truly are intended to treat rare diseases and do not have a broader market. We believe the practice of providing orphan drug designation to a drug that has been readily available for years outside the country — and sometimes within the U.S. at low cost — is inconsistent with the intent of the Orphan Drug Act. The FDA should not grant orphan designations for new versions of existing drugs. This is another area of concern in the pharmaceutical market where manufacturers restrict the distribution of some medications to a few select pharmacies. Of all the medications that CVS Health pharmacies dispense, limited — or exclusive — distribution drugs make up a very small percentage. Such drugs typically have no therapeutic alternatives, have small patient populations with a need for the medication, and require a high level of complex pharmacy service. Drug manufacturers often restrict medications to a limited or exclusive distribution for various reasons, including when a Risk Evaluation and Mitigation Strategy is required by the FDA to evaluate safety concerns, in order to ensure that the benefits of the medication outweigh its risks. Given the lack of therapeutic alternatives, and the need for additional safety measures, such drugs can often have a big impact on payor spend. 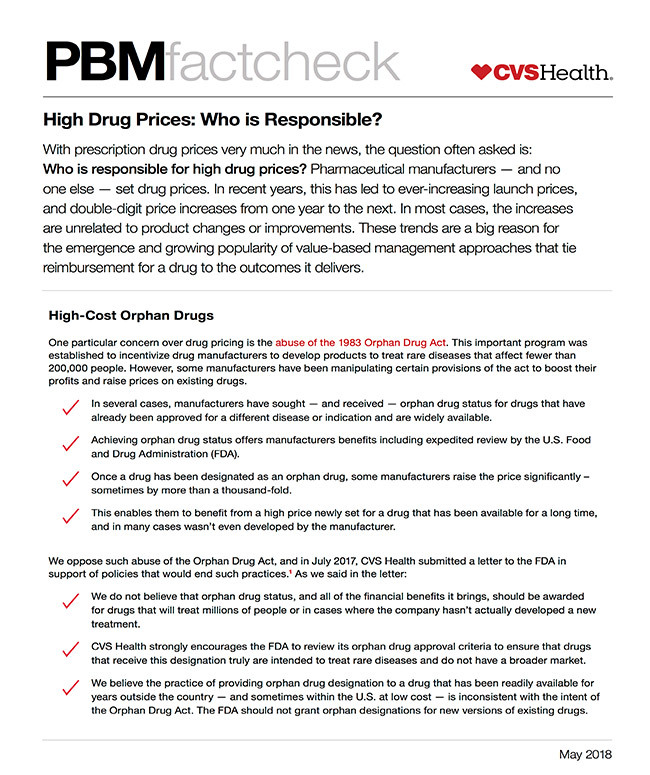 CVS Health's pharmacy benefit manager, CVS Caremark, applies the same evaluation standards of cost, clinical effectiveness and availability of therapeutic alternatives to all medications, regardless of whether they are limited or exclusive distribution drugs. CVS Caremark offers clients a range of proven solutions to help manage drug costs, such as formulary management, clinical services and preferred pharmacy networks. Our innovative formulary strategies often place high-cost drugs that have clinically-appropriate, lower-cost therapeutic alternatives available, on higher tiers or require pre-approval, or coverage exceptions, to ensure that the right patient gets the right drug at the right time, while helping payors control costs. In 2017, drug price growth for clients aligned to one of our managed formularies was nearly flat, at just 0.2 percent, despite manufacturer-driven inflation of nearly 10 percent. Trend for commercial clients was the lowest in five years — 1.9 percent — and 42 percent of clients spent less on their pharmacy benefit plan in 2017 than they had in 2016. For clients aligned with our managed formularies, drug price declined by 0.1 percent in 2017. CVS Caremark’s focus as a PBM is to help our clients lower the cost of prescription medications while also improving health outcomes for their employees and plan members. We offer a range of proven solutions to help our clients manage their drug costs such as formulary management, clinical services and preferred pharmacy networks. We also proactively advocate for policy changes that can help curb anti-competitive behavior by manufacturers, on our clients’ behalf. Data source: unless otherwise noted, CVS Health Enterprise Analytics, 2018. This document contains references to brand-name prescription drugs that are trademarks or registered trademarks of pharmaceutical manufacturers not affiliated with CVS Health.